A value 1-drop which is reminiscent of Fire Fly. Not as strong as Fire Fly because it’s a deathrattle effect and has a weaker body. 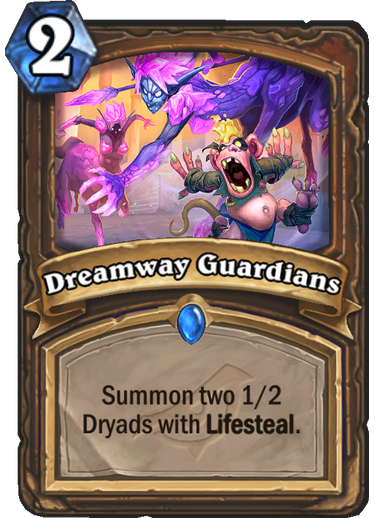 However, it provides Druid with a turn 2 play if it dies, and the class has obvious synergies with token-based strategies. Any deck that runs Savage Roar and Power of the Wild will want this card, and it should become one of the stronger 1-drops in Standard format. Holy Smite or Flash Heal, in one card. This versatility makes it more valuable than the separate choices. 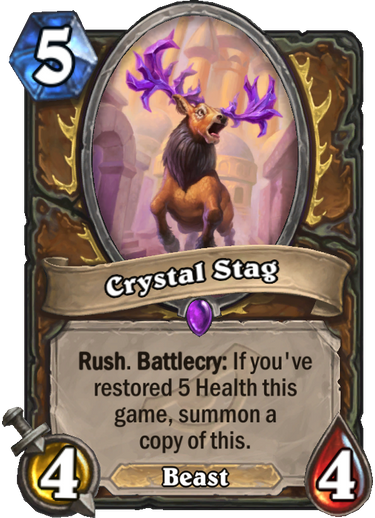 The healing effect might be important in a Druid deck built around healing which is promoted in this set, making Crystal Power the best enabler available. 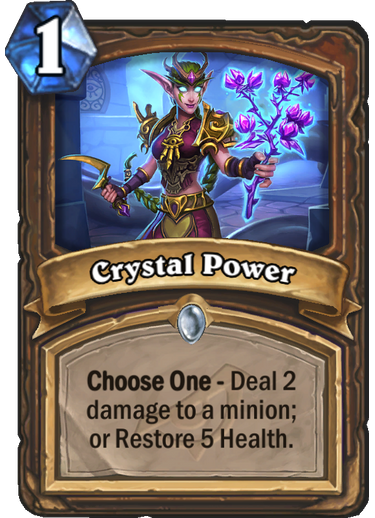 But regardless of whether a healing Druid turns out, Crystal Power is a strong enough card on its own and provides Druid with removal, something it never has too much of. 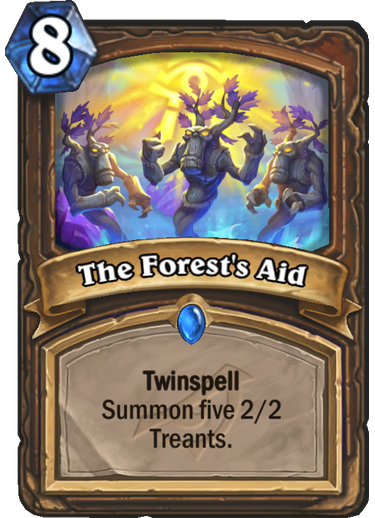 This card is expensive for what it does, though it has a chance of seeing play in Token Druid just because board buffs are so important to the deck. Compared to Mark of the Lotus, this card looks very weak, but that MotL was just unfair. At 2 mana, Blessing of the Ancients might be too strong. At 3 mana, it’s borderline. The card’s playability becomes a factor of just how good its archetype is. Pretty well-rounded 2-drop that synergizes with a Druid deck that is focused on spells, generating tokens or just survival. Annoying to deal with for most aggressive decks and helps complement Druid’s removal kit. We can see different kinds of decks running this card because it’s so versatile and allows the class to fight for the board in the early game. Decent stats for 3 mana. 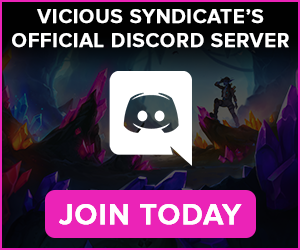 Great follow up to Dreamway Guardians. The question becomes whether there are enough healing effects to make this card worth running, and it’s very likely that a deck with Lifeweaver will require neutral healing. Keeping Potion Vendor in mind, it might be worth considering because it’s such a strong effect for basically no stat penalty. This card is likely to get better with future sets. 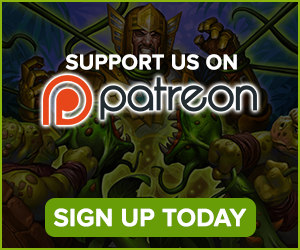 The strength of token generating Druid decks usually lie in their ability to produce enough threatening boards, beyond the opponent’s ability to clear them. Taking that in consideration, this card is extremely powerful. With Wispering Woods and Soul of the Forest, Token Druid will be able to constantly reload the board in slower matchups, and one unanswered turn is all that’s necessary to Savage Roar into a victory. This card should also close games in aggressive matchups provided the Druid survives to that point. 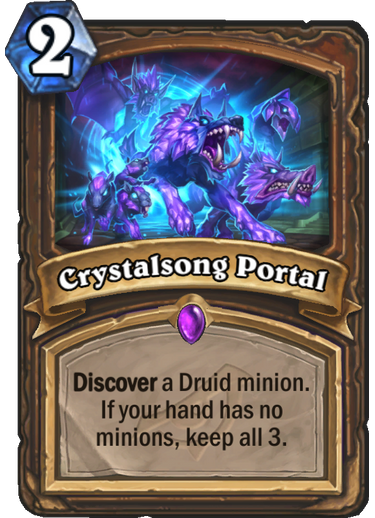 2 mana for 3 class minions is an incredible deal, making Crystalsong Portal one of the strongest and most efficient value generators in the Year of the Dragon. The restriction isn’t that difficult to comply with, since Druid has plenty of spells that generate boards, and it can still use cheap minions that are easy to get out of hand. This is the kind of card that could warp an entire archetype around it, much like Master’s Call. When activated, this card is absurd. 5 mana for two 4/4 rush minions is an amazing deal, and only requires a single use of Crystal Power to get online. This card helps Druid’s historical weakness, before Spreading Plague was around, of fighting off board pressure when behind. The problem is that it requires us to run a more dedicated healing deck to ensure its consistency. Whether Healing Druid is strong enough in this expansion is difficult to say, but this card’s entrance to the meta might be just a matter of time. We can easily see it becoming more powerful with further support in future sets. Fandral 2.0 or mini-Fandral. 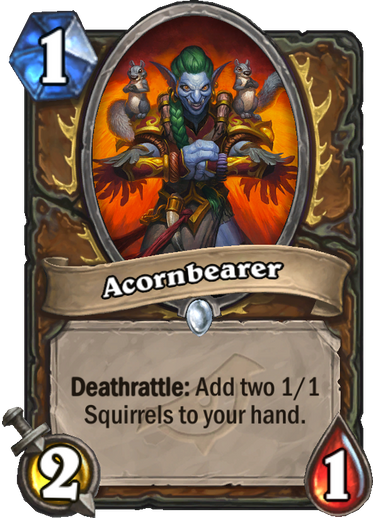 Whatever you want to call it, this card will likely be played in nearly every Druid deck for the next 2 years. A 2 mana 2/3, paying no stat penalty, for an incredible card draw effect. 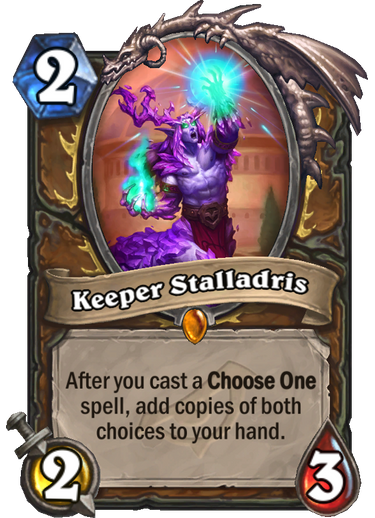 Wrath, Crystal Power and Power of the Wild are all very cheap spells that get a big boost with Keeper Stallandis, and there are others to consider, such as Mark of the Loa in a Token Druid deck. Just good. 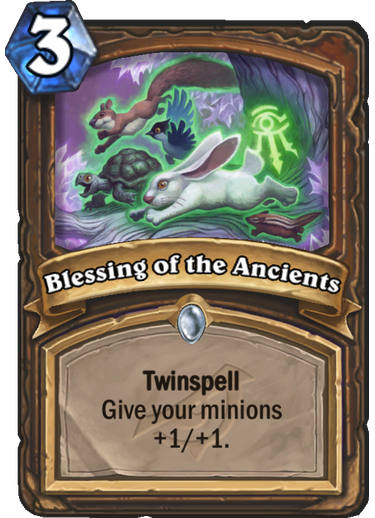 This card is probably the biggest reason why we’d be skeptic about a Druid deck that’s entirely built around healing. 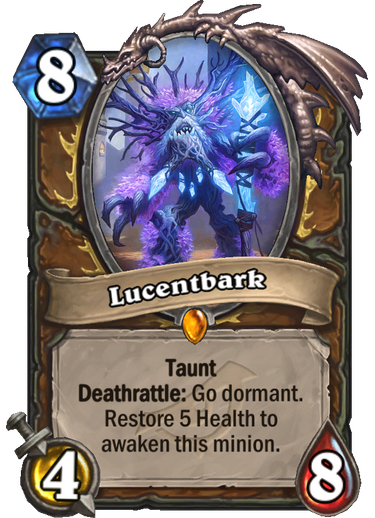 The idea is cute: we play Lucentbark, copy it and resurrect it until we have a wall of 4/8 taunts that make Sherazin look tame. We can play Zilliax, Rotten Applebaum, Ancient of Lore and Potion Vendor to further fuel the synergy. The problem? 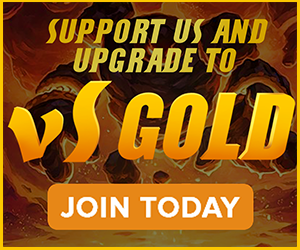 Sap, Hex, Polymorph or a single silence can easily ruin these plans, leaving us with a 4/8 taunt that we paid 8 mana for. Suddenly, Ironbark Protector doesn’t look that bad in comparison. Flobbidinous Floop might save the tree man from being unplayable, but this card might be all Lucentbark, and no Lucentbite. 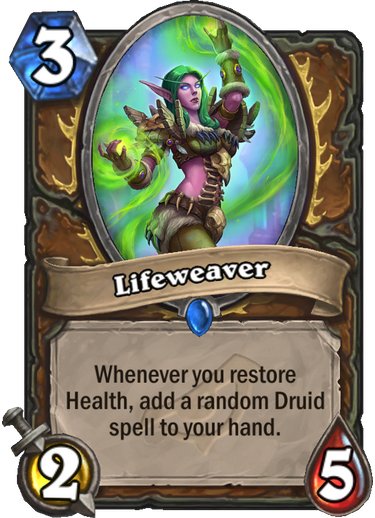 Druid got a great set of cards that will get stronger in future sets but should already be quite effective on April 9th. 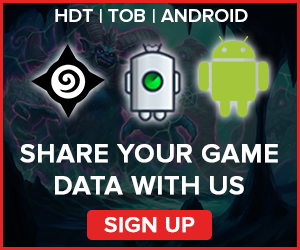 We can see multiple playstyles of Druid having success with Token Druid being the most obvious suspect. Malygos Druid could also be revived through Jepetto or other means. There is life after Ultimate Infestation.